Happy Thursday! Scarves are my favorite this time of year! There are so many fabulous options that it is always hard to have just one! Come share your fall scarves with Elle and I! 1. 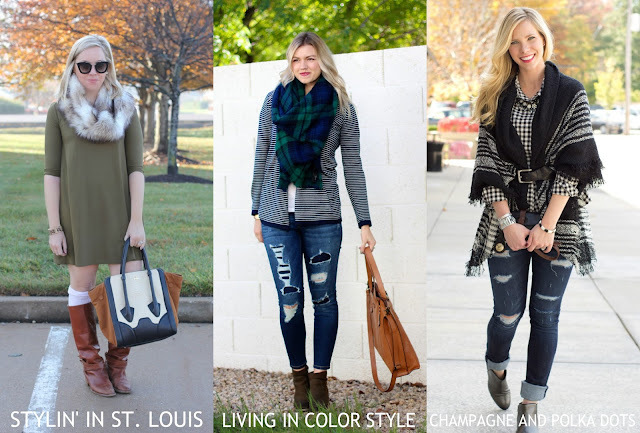 We kindly ask that you follow the two hosts: Elle from Living in Color Style, Jacqueline from Stylin' In St. Louis, and our co-host Jenna of Champagne and Polkadots via Bloglovin or GFC. Spotlight: Our spotlight this week is Ana of Northwest Blonde! Ana'a pop of orange is just perfect for our theme last week! We love that you can recreate this look so many ways! Just perfect! Be sure to check out her blog! Next week: Next week our spotlight weekly theme is stripes. Thanks for linking up! See you next week! your scarf is so cute and cozy, love that olive dress too. Love this fur scarf, it looks so cozy & chic! Such a pretty look. Love your cozy scarf! This is such a fun look! I am pinning this outfit, because I love it so much! Great scarf, dress and I love the boot socks, too! Oh, and the sunnies! Totally a blog worthy look! I love the olive green dress and that fab fur scarf is just amazing! This is such a pretty look! I love the olive dress and scarf! The snood made the look even lovelier and cozier! I love everything about this look! Great neutral palette and the snood looks so cozy! I love this look!! Your scarf is so perfect for fall! I am obsessed with your fur snood! And the cut of that shift dress is great! Really great mix of colors and textures! I've been wearing a ton of scarves lately! The perfect fall accessory. Such a pretty fur scarf! Lovely look! I absolutely love your scarf! Absolutely love the fur scarf, especially with the olive dress! Such a lovely outfit,... I love your scarf!